Our range of products include bipap machine a-40, philips bipap a 30 bi level ventilator and bipap- bi level positive airway pressure device. Designed as a portable ventilator, BiPAP A40 comes with well-known and proven Philips Respironics technologies such as Auto-TRAK, AVAPS, and Dry Box humidifiers. 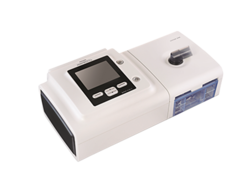 BiPAP A40 is capable of invasive and non-invasive bi-level pressure ventilation, up to pressures of 40 cmH2O. Lightweight and with a detachable battery module, BiPAP A40 can provide autonomy and increased mobility to patients. Looking for BiPAP- Bilevel Positive Airway Pressure Device ?